After asking for requests on Twitter, it appears most Kansas football fans want to know what exactly is going on with the Jayhawks’ struggling offense. With that in mind, I decided to switch it up this week. Instead of Coach singling in on a single play, I had him take a look at every offensive play for KU from the first quarter of the Jayhawks’ 27-17 loss to TCU on Saturday. I asked him to take notes, then share with me any general observations he had based on the film. • “One thing I noticed, TCU was stacking the box pretty good. They had a lot of guys within 10 yards of the line of scrimmage. That means they think your passing game isn’t good enough to beat them. They’re going to force you to try to pass to beat them, but they don’t think you can. They’re not going to let you just line up and run it. • “I thought KU had some nice play designs with motion to give some different looks. Even though they might run some similar-style plays, they were motioning to get into different looks and to try to help out with spacing. “On the play above, you see how they motion the back out of the backfield? It widens a couple of these defenders down here. I think TCU basically starts out in a seven-man box. It gets the outside linebacker out of the box right here to the right of KU. It makes it a six-man box instead of a seven-man box, which is a little easier to run against. “On this play, they motion the receiver all the way across the field. It makes the linebackers shift over. They could have run that motion to set up a play for later in the game. It looks like after they hand off to the fullback, they’re looking to see if they’ve got the pitch to Sims going out there to the left. Now they’ve motioned their other receiver over there for an extra blocker if they do come back to run that play later. “On this one, they’re just motioning from a two-by-two (receiver) set to a three-by-one set, trying to probably get a different matchup, maybe get a slot receiver lined up on a safety or a linebacker. In this case, I think they end up getting him on a corner. Not necessarily the look they wanted, but they were trying to motion to get a matchup they wanted. I’m sure if (the QB) wouldn’t have been pressured, he would have had a little better chance to go to maybe one of these other receivers that was getting a better matchup. • “I thought the quarterback was sloppy with the ball. He hit the running back on his hip that one time when he was running a play-action fake and put the ball on the ground. • I also thought he was inaccurate with his throws. He threw it to the running back in the flats one time and didn’t give the running back an opportunity to run after the catch. He also threw one behind his receiver over the middle that could have resulted in a first down if he was more accurate. • “I thought he forced the ball in there a couple times into coverage. TCU is obviously very good on defense, so they had a lot of tight coverage. Sometimes, you have to throw it to a guy who might be covered, and you expect your guy to go and make a play, but I thought he forced the ball a little bit too much. • “One of the biggest things — and I put three or four checkmarks by it — (the Jayhawks) were getting beat up front. Period. If you’re not going to be able to block the down linemen, it’s going to be hard for you to win a football game. It all starts up front on both sides of the ball, and they were getting physically manhandled up front. “On this play, you see No. 96 (red circle)? He just takes the offensive guard [Mike Smithburg] and shoves him back into the backfield there. The two D-tackles are just wearing out the guards right there, blowing them up all the way into the backfield. The tailback’s got no chance right there. He could be the best tailback in the world, and it’s going to be hard for you to get yards. “I will say this: (Running back James Sims), he’s doing all he can. He’s running hard and going downhill and trying to find yards. I’ve got to commend him for his effort. “(TCU has) a four-man rush right here. They’re not blitzing anybody. KU’s got six guys in to protect, including the running back. So it’s six-on-four right here. If I was the (coach) … it’s just a little disappointing that we’ve got six guys into protect, they’re rushing four, and it’s a party in the backfield, essentially. The D-ends both get upfield. You’d like to think your quarterback could step up in the pocket, but then again, both D-tackles are getting great push back into the backfield as well. So the quarterback doesn’t have anywhere to step up and get rid of the football. 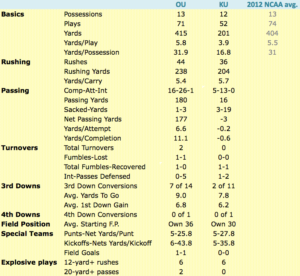 • “I also saw that TCU was blitzing a couple times, and KU didn’t check out of the play. A lot of times, if you see that blitz or you go on a double-cadence [bluffing the snap call, then backing off the snap to get a chance to change the play if needed], sometimes you can get out of the play and get into a play that might be better versus that blitz. Also, that’s tough sometimes if a team disguises their blitz, but the blitz jumped off the screen at me like that just watching the video one time, you think they’d be able to read it and figure out a better play to run. “On this play, TCU brings those two linebackers right there up the middle; just a pretty standard ‘Bullets blitz’ is what that’s called. They’re both blitzing the ‘B’ gap [space between guards and tackles on each side]. If you see those two guys coming, you know you’re probably going to have man-to-man out on the edge. You might think about checking out of this run play and getting in a pass play. They stick with it, and the one ‘backer goes unblocked and makes a big play in the backfield. “We’ve got certain checks that we give our guys: ‘If you see it, get out of it.’ Sometimes we’ll go on double-cadence to make sure we’re seeing exactly what they’re doing. That’s how we do it, but I know other guys do it a little bit differently. Sometimes with these blitzes, you’d want to get out of a play. So what were Coach’s overall thoughts after watching the film? “You’ve got to give the other team credit, too. I know TCU has a good defense,” Coach said. “They’ve got great players on their team. That’s obvious. “But there’s things on this tape where a guy is getting physically whipped one-on-one. I’ve got to man up. I’ve got to step up to the plate and do my job. It’s 11 guys across the board doing their job. That’s why football’s the greatest game on earth: It takes all 11 guys for success to happen.